Bandung is the capital of West Java and also one of the metropolitan cities in Indonesia. 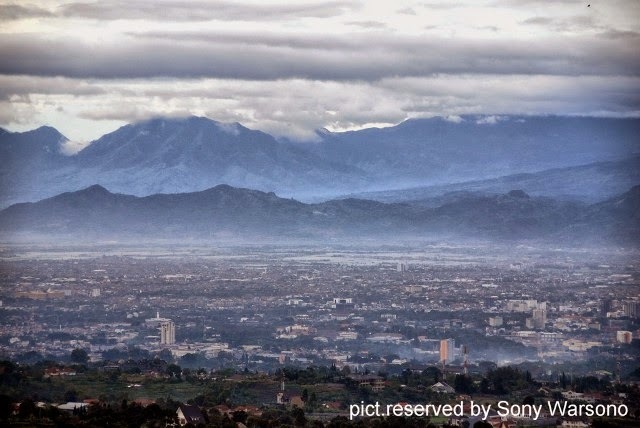 As the third most populated city in the country, Bandung has around 2,4 million inhabitants. This city is filled with numerous shopping centers including factory outlets that offer many high quality local products. Many can be found at Jl. Riau, an area that is visited by plenty of local and foreign tourists. Located near the mountains, the weather in Bandung is quite cold especially in the north which is surrounded by green, clean and pollution-free areas. This city preserves many of its historical sites from the past such as old buildings with Dutch architectural styles. These buildings can be seen at Jalan Diponegoro and Jalan Braga. From Jakarta, Bogor and South Tangerang, Bandung can be reached within 2 to 3 hours by car. According to the philosophy, the name ‘Bandung’ derives from Banda and Indung. Banda means all things in the universe whereas Indung means earth. Combined, the term Bandung means earth that contains air, land, plants and creatures. Bandung had possessed a couple of nicknames. During Dutch Colonization, Bandung was called Paris van Java (Paris of Java) by Dutch people. The only reason was, they thought the city resembled Paris, one of the most beautiful cities in the world. Moreover, in 1946, Bandung was also called Bandung Lautan Api (Bandung land of fire). The name appeared after 200.000 local people burnt their houses and belongings as a protest against the Dutch. In 1955, Bandung became the host of the first Asia-Africa Conference. This conference was held to create a treaty among developing states. The objective was to reject economic colonization by developed countries. This area is dominated by several factories and settlements. Padalarang is where the first paper factory in Indonesia is located: PT Kertas Padalarang. With an area of 48.42 square km, Cimahi is one of the areas in Bandung known for exporting textiles. Kota Baru Parahyangan is a satellite city which was built to improve education, science and technology. Lembang has some of Bandung’s best tourism sites such as Floating Market, Dusun Bambu and De’Ranch. As a one-stop holiday district, Dago offers a variety of holiday activities from shopping, culinary to zoo tour. In Ciumbuleuit, you can visit Punclut (the highest level of the area) and view one of the best landscapes of Bandung. One of Indonesia’s top colleges, National Hotel Institute (NHI), is located in Setiabudi. Around this district, you can also find many Surabi (Indonesian pancake) on Jalan Dr. Setiabudi. Cilengkrang is where the famous Cilengkrang Waterfall is located. In Cibiru, you can visit Palasari Book Market. Cibiru is also known as the location of Bandung’s popular Islamic university, UIN Sunan Gunung Jati. Cileunyi covers the area of Cinunuk, a village that still preserves Sundanese arts and culture. This village is located 500 meters away from Jalan Raya Cileunyi. This is one of the areas where you can enjoy Bandung’s fresh air. It is where Kawah Putih Ciwidey and the strawberry field are located. In Pangalengan, you can visit Cisangkuy River popular for rafting. Other than natural areas, South Bandung also has Si Jalak Harupat Stadium, a stadium as well as the base of the local soccer team PERSIB. Travelling to Bandung by airplane will land at Husein Sastranegara International Airport (BDO). This airport is also one of the national military (TNI) Air Force bases. Husein Sastranegara International Airport provides Primkopau taxi with fare starts from IDR 45.000. Angkot is the city’s public transport. Angkot fare from Husein Sastranegara International Airport to Bandung starts from IDR 2.500. Angkot stop is only 10-minute walk from the airport. Husein Sastranegara International Airport provides car rentals which cost from IDR 300.000 per day, depending on the car type. Bandung’s main bus terminal is Leuwipanjang. To get to the terminal, you can leave from big cities such as Jakarta, Tangerang, Bekasi or even Bali. The main train station in Bandung is called Bandung Hall Station. It takes around three hours by train from Gambir Station or Pasar Senen Station (Jakarta) to Bandung Hall Station. Other than Hall Station, Bandung also has another station called Kiaracondong Station. Either by car or motorcycle, a trip to Bandung will take around 3 to 4 hours depending on traffic. Angkot is one of Bandung’s popular public transports. It can be found almost everywhere in Bandung. Angkot fare starts from IDR 2.500, depending on distance. Blue Bird taxi fare starts from IDR 7.000 and IDR 3.600 per kilometer. DAMRI bus serves routes to almost every part of Bandung. DAMRI bus fare is around IDR 2.000 (Economy) and IDR 3.000 (AC) per person. Car rental in Bandung costs around IDR 350.000 per day, depending on the car type. If you want to rent a car without a driver, make sure you become more familiar with the routes as they can be quite confusing for newcomers. Located 768 meters above sea level, the climate in Bandung is cooler than Jakarta. The temperature in Bandung may reach up to 22 degree Celsius in the afternoon and 17 degree Celsius in the evening. Sundanese or Bahasa Sunda is the local language spoken daily. However, Sunda has several dialects also spoken in areas outside Bandung such as Bogor and Indramayu. Priangan is Bandung’s particular dialect. “Kumaha damang?” means “How are you?”. “Hatur nuhun” means “Thank you”. Located in Patuha mountain, Kawah Putih Ciwidey offers you a unique lake. The water is white, green and sometimes turns to brown due to the fluctuating temperature. The right and left sides of Kawah Putih Ciwidey are surrounded by beautiful tall tropical trees. Built in June 2011, Bandung Trans Studio is owned by PT Transcorp Indonesia. This studio is the biggest indoor theme park in the world with an area around 4.2 hectare. There are 20 exciting rides for both children and adults such as Giant Swing and Vertigo. To enter Bandung Trans Studio, visitors must have a Mega Cash card. This card can be used to try 20 of those exciting rides. The card costs IDR 10.000. If you want to be a cowboy in a day, De’Ranch is your destination. The large and green area at De’Ranch brings you back to the era of cowboy. Experience riding a horse just like a cowboy. Besides riding horses, visitors can also try flying fox and trampolines. The price starts from IDR 15.000 per session. When you visit Bandung with the family, you must not miss out the excitement at Kampung Gajah Wonderland. Kampung Gajah or the Elephant Village is not a village full of real elephants. These elephants are merely decorations. There are 20 exciting rides vary from swimming, culinary to shopping for souvenirs. You can enjoy these rides in one whole day for IDR 150.000 per visitor from Monday to Friday. In the weekend and holiday, the price is IDR 200.000. Tangkuban Perahu is a mountain with a shape resembling an overturned boat. According to the myth, a legendary character called Sangkuriang kicked a boat until it flipped upside down. This boat was later known as Tangkuban Perahu. Recently exploded in 2013, Tangkuban Perahu mountain is about 2.084 meters high. Angklung is an Indonesian musical instrument made of bamboo. At Saung Angklung Udjo, you can watch semi-traditional to modern music performances using angklung and bamboo handmade crafts. Visitors at Saung Angklung Udjo can also learn the history of angklung from the angklung players. Saung Angklung Udjo also offers various souvenirs made of bamboo, t-shirts, and many more. Gedung Sate is the city’s icon. It was believed to be the most magnificent building in Bandung during the Dutch colonization. Once managed by the Dutch, today’s Gedung Sate is the West Java government headquarter. The building uses the term Sate since the peak looks like pieces of satay (a popular Indonesian cuisine). Gedung Sate is also surrounded by other historic buildings such as Indonesian Postal Museum, Geology Museum, and Dwiwarna Building. Braga is one of the main streets in Bandung that never sleeps. Located between buildings built with Dutch architectural styles, the area was once known as the fashion hub. Braga was once identified as the area of prostitution like Amsterdam’s Red Light District. Embassy is one of the most-visited executive clubs by both teenagers and adults in Bandung. Hip-hop, House and RnB are the signature music at Embassy. SierraSierra is a must especially for couples. This 3-floor restaurant gives you a romantic atmosphere, especially at night. Address: Jl. Bukit Pakar Timur No. 33, Bandung, West Java. Beware of taxis that set prices above average. To have a safe trip in Bandung, make sure you choose a taxi with taximeter such as Blue Bird taxi. For fruit and scenery lovers, spend some time at Ciwidey and visit the strawberry field. Pick some strawberries to bring home. Prepare to bring thick clothes if you plan to spend a night in Ciumbuleuit. The temperature here may drop to 15 degree Celsius in the morning. Avoid walking at night alone in Nanjung, Cibeureum, Padalarang, Lembang and Maribaya as these areas are known to be rather unsafe at night.